NRHS Staff, School Policies, What's New? Mrs. DeVost, NRHS English teacher, is a member of the NRHS Grading Committee and a huge proponent of the proposed changes to report cards. She mentions that although she hasn’t heard of very many parents concerned with the report card outlay, the improvements would help teachers out a lot. “It’s like working in two different worlds,” Mrs Devost says, explaining the difficulty in turning teachers’ mandatory rubrics into letter grades. Both Mr. LeBaron and Mrs. DeVost agree that report cards need to not only show a student’s progress, but how the teacher is meeting the student’s needs and where they aren’t being met. 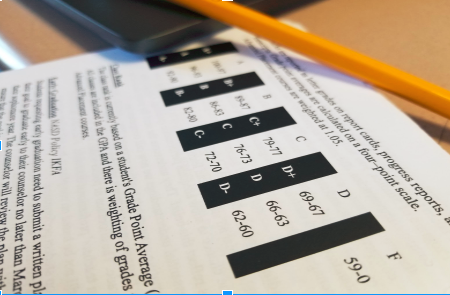 Further changes, like the proposal’s effect on GPA calculations, the use or abandonment of progress reports, midterms, and finals, and the actual grading scale itself are all still being discussed in committee. It’s unclear when these changes will take hold, or to what degree, but the committee is said to be working to implement the new grading and reporting protocol as early as next year.